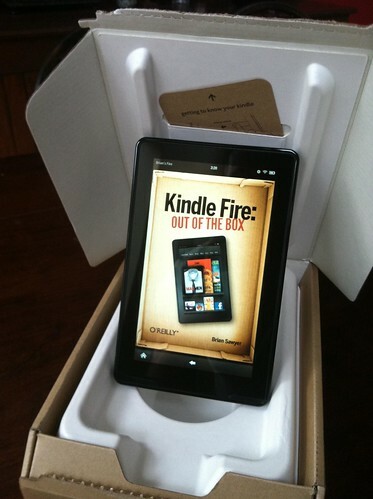 Got a Kindle Fire? Check out my new 75-page ebook (also available in the Kindle store) to get up and running in no time! When you open the box for your brand-new Kindle Fire, you’ll find the hottest 7-inch tablet to hit the market, a power adapter, and a “Quick Start Guide” that tells you how to turn it on. But to really take advantage of all the content and features the device has to offer, you’ll need a little more. Kindle Fire: Out of the Box gets you up and running beyond the first “Slide to unlock” screen to unlock all of your media from the cloud in the palm of your hand. Whether your media library lives in Amazon Cloud Drive or on your device, the Fire gives you immediate access to all of it, wherever you are, as long as you know where to find it and how to consume it. With Kindle Fire: Out of the Box, you’ll jump right in to reading full-color magazines, newspapers, newly enhanced ebooks, and your own personal documents. Quickly download music from your Amazon Cloud Drive or new music from the Amazon MP3 store to listen offline, and get instant, unlimited access to streaming of over 10,000 popular movies and TV shows. And go beyond your own media to experience integrated email, games, Android apps from the Amazon App Store, and ultra-fast web browsing with the revolutionary, cloud-accelerated Silk browser. Next up: NOOK Tablet: Out of the Box.